After having a lovely stay in the village over looked by the castle that had been built on top of a volcano, I wanted to head more towards Firenze (Florence). After getting in to Tuscany, I have found myself slowing down quite a bit, as the need to ‘be somewhere’ is evaporating, unlike the gas cylinder. Using the Camperlife app gives you the information on sites, services and costs as to those in the area which is how I have come across these lovely and free stops across the country, well, when they are there. En route to Radicofani, there were three non-existent sites, and behold things weren’t going to change too quickly in the run up to Firenze. The main town between me and Firenze is Siena, and though it had a so-so write up in the Michelin guide, there was nothing in there that was inspiring me to spend 20 Euros for one night. However, with the stop over in Florence being free, the trade off is no services. This means that between me and Florence, I have to empty the poo bucket somewhere! San Gimignano, small walled town with big clocktowers on a hill. Pretty much that is it. Very steep hill, no shops leading up to or away to the campstop 6km on the far side at the bottom of the hill. Bugger that. Off to the next one which tells me it is outside of C.I. Caravans. Sounds great cos I need some more loo chemicals so I take that one and tap it in to the sat-nav. Only to find an industrial estate and a big car park. The camper service area is bolted down, no where to empty grey water and no clean water and no cartridge toilet drain. Doing well, still I had two days to my birthday which was going to be in Firenze come hell or high toilet water. I decided to bed down in one of the camper parking spaces in the car park to the C.I. Caravans manufacturing site, no accessory shop at all. New day, new hope for refilling in Poggibonsi. Supposedly a purpose built communal camper service stop in a recreational park. Well it would have been if it had been not broken. I was able to empty the grey water but not refill or refresh the bathroom. This was the last opportunity before Florence, so I bit the bullet and thought if I get to a camper stop in Florence with services, I can pay for the services and then go on to the free carpark. Which I did only I didn’t get to pay because the barrier was broke so I had to drive out the in way! Firenze. The principle town of Tuscany and one of my main reasons for coming! Absolutely beautiful. The green and white marbled buildings with terracotta roofs stand out magnificently in the light. The cathedral is just out of this world. Here, art and history are thrown at you from every direction, and though the crowds and queues are long, the rewards are worth it tenfold. Though I have to say after awing at the sepulchre built by Michaelangelo, I was a bit gobsmacked at the contents and make up of the reliquaries. Fingers, ears, bones and teeth wrapped in gold, silver and glass for eternity. No idea why, less it was for other people to receive blessings from the dead one inside. Or what was left of the dead one, after they had been chopped up and shared about a bit. It did not sit easy with me at all. 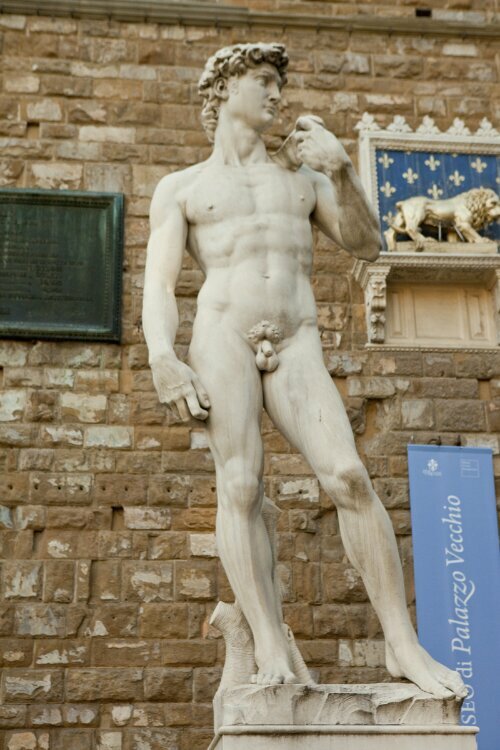 Michaelangelo’s David (this is a copy in the square in front of the Medici Palace) was another awe inspiring event. Basically the room had been created for him to be put in. The copy, obviously on display in the open air, doesn’t do the white marble justice of the original. The hidden detail in the veins and things is quite remarkable, along with the sheer size. As in other museums, art galleries and churches, photography isn’t allowed (unless you are an uncouth American apparently), so I did at least respect that. I spent my birthday in the Uffizi Gallery on the trail of Caravaggio again and in the evening took myself out for a meal and a half carafe of rose. The decision inevitably forced because the temperature was about 38 degrees and annulling any sense of hunger. I did though have a coffee and a sandwich in the same cafe for 5 out of the 7 days I was in Firenze though, making myself something of a regular.